The entire financial system of the western world is designed to be a debt spiral. The total amount of money and and the total amount of debt are supposed to continually expand. Today, we are in debt up to our eyeballs and it seems like nearly everyone is talking about “deleveraging” and reducing government debt. But in a world where the entire financial system is based on debt, is there any way for massive deleveraging to take place without plunging us all into a horrific worldwide depression? The governments of the western world have had a lot of fun spending money as if there was no tomorrow, but now tomorrow has arrived and all of that debt is rapidly catching up with us. Politicians in Europe and in the United States are running around trying to come up with a “plan”, but there is no “plan” that is going to fix the current debt-based system. Over the next few years we are going to reap what we have sown. For fiscal year 2011, the U.S. federal government had a budget deficit of nearly 1.3 trillion dollars. That was the third year in a row that our budget deficit has topped a trillion dollars. Sadly, most Americans simply have no idea how much money a trillion dollars is. Perhaps an illustration or two would help. If on the day when Jesus was born you began spending one million dollars every single day, you still would not have spent one trillion dollars by now. That is how large a trillion dollars is. If you went out today and started spending one dollar every single second, it would take you over 31,000 years to spend one trillion dollars. Some people have suggested that we could solve our problems by taxing the rich. Well, if Bill Gates gave every single penny of his fortune to the U.S. government, it would only cover the U.S. budget deficit for about 15 days. No, the truth is that what we have is a spending problem. The U.S. federal government is spending way, way too much money. Total U.S. government debt will soon cross the 15 trillion dollar mark. Should we do something to celebrate such a monumental national achievement? It really takes a special effort to borrow 15 trillion dollars. We have accumulated the largest mountain of debt in the history of the world, and yet our government continues to add to our debt at a blistering pace. If the federal government began right at this moment to repay the U.S. national debt at a rate of one dollar per second, it would take over 440,000 years to pay off the national debt. Unfortunately, we are not paying it off right now. Instead, we are adding even more to it. Back in the early 1980s, Ronald Reagan declared the national debt to be a national crisis. Well, today our national debt is more than 14 times larger than it was when Reagan took office. Something has gone horribly, horribly wrong. Right now, spending by the federal government accounts for about 24 percent of GDP. Back in 2001, it accounted for just 18 percent. Spending is going in the wrong direction. And most government spending goes into the pockets of individual Americans. 59 percent of all Americans now receive money from the federal government in one form or another. We have got tens of millions of Americans that are completely and totally addicted to getting money from the federal government. But wasn’t the Tea Party supposed to do something about all of this crazy government spending? Unfortunately, the Tea Party has failed in this area. In the mainstream media there is talk of “austerity” by the federal government, but the truth is that spending by the federal government has increased by about 5 percent so far this year. We are hurtling toward a “debt wall” and the brakes don’t seem to work. Europe is in a massive amount of debt trouble as well. In fact, a financial meltdown is probably going to happen in Europe before it happens in the United States. Greece, Portugal, Ireland and Italy all have debt to GDP ratios that are well above 100%. Spain is in a massive amount of trouble as well. Right now, Greece, Portugal, Ireland, Italy and Spain owe the rest of the world about 3 trillion euros combined. Greece is on the verge of a default of one form or another, and Italy and Portugal look like they will not be far behind. As the financial world braces for a Greek default, the yields on Greek bonds are going absolutely crazy. The yield on 2 year Greek bonds is now over 70 percent. The yield on 1 year Greek bonds is now over 170 percent. Sadly, it looks like Portuguese bonds are starting to go down the same path. The yield on 2 year Portuguese bonds is now over 17 percent. A year ago the yield on those bonds was about 4 percent. European banks are also drowning in an ocean of debt. According to renowned financial journalist Ambrose Evans-Pritchard, banks in Europe need to reduce the amount of lending on their books by about 7 trillion dollars in order to get down to safe levels…. But can that be done safely? Can that be done without plunging Europe into a financial nightmare? The risk is “Japanisation” without the benefits of Japan: without a single government, or a trade super-surplus, or 1pc debt costs, or unique social cohesion. Already the financial crisis in Europe has pushed unemployment to frightening levels. So what will happen if you add massive deleveraging to the equation? Ambrose Evans-Pritchard is very concerned about what might happen in some of the most troubled nations…. Even today, the jobless rate for youth is near 10pc in Japan. It is already 46pc in Spain, 43pc in Greece, 32pc in Ireland, and 27pc in Italy. We will discover over time what yet more debt deleveraging will do to these societies. Major European banks not only have too many loans on their books – they have also borrowed way, way too much money themselves. The truth is that most major European banks are leveraged to the hilt and are massively exposed to sovereign debt. Before it fell in 2008, Lehman Brothers was leveraged 31 to 1. Today, major German banks are leveraged 32 to 1, and those banks are currently holding a massive amount of European sovereign debt. What all of this means is that we are on the verge of some really bad stuff. 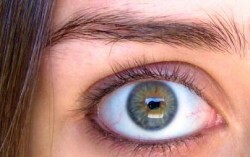 The governments of the world are up to their eyeballs in debt. According to the Economist, the governments of the world combined are more than 40 trillion dollars in debt. But that total only counts government debt held by the public and it does not include any future obligations (such as Social Security, etc.) owed by national governments. It would be hard to overstate how much of a crisis this is. But just like with the subprime mortgage meltdown of a few years ago, a number of very savvy investors and economists can see what is coming. For example, Texas investor Kyle Bass made millions and millions of dollars betting against subprime mortgages, and now he is warning that we are facing a crisis much greater than that. Bass believes that the European debt crisis is soon going to explode. In particular, he has been putting his money into investments that will pay off big if Greek debt collapses. But that is not all Bass has been up to. He has been stockpiling gold, guns and nickels (20 million nickels to be exact). Bass appears to be well prepared for the coming economic collapse. The following is how one writer described his visit to the 40,000 square foot “fort” owned by Bass…. If only the rest of us were so well prepared, eh? So if this is the kind of thing that the “financial experts” are doing, then what is the message for us? A great storm is coming, and most Americans are going to be totally unprepared for it. Not that things are not really, really bad already. According to Shadow Government Statistics, the “real” rate of unemployment in the United States is creeping up toward 25 percent. So what is going to happen if a worldwide depression hits? Things could get very, very interesting over the next few years. A significant percentage of Americans have already lost faith in the system. According to a new Gallup poll, 44 percent of all Americans say that our economic system is “unfair” to them on a personal level. But sadly, most Americans don’t really understand the mechanics of our financial system. They don’t understand what actually makes it unfair. That is why we need to work so hard to educate the American people about the Federal Reserve. The Federal Reserve system is at the very heart of our financial system, and it was designed to get the U.S. government perpetually enslaved to debt. At this point, the U.S. national debt is 4700 times larger than it was when the Federal Reserve was created back in 1913. It looks like the creators of the Federal Reserve achieved their goal. Posted below is a cartoon that was published one year before the creation of the Federal Reserve. 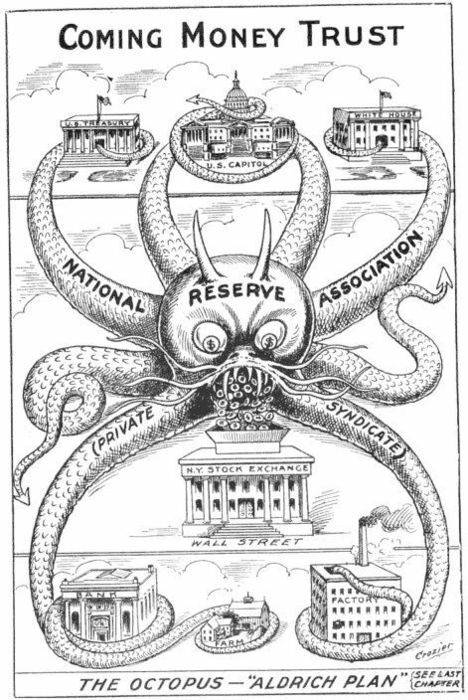 The intent of this cartoon was to criticize the “Aldrich plan” which was a precursor to the plan to create the Federal Reserve. As you can see below, the creator of this cartoon had a good idea of what would happen if the plan put forward by Rhode Island Senator Nelson Aldrich was adopted. Today, the Federal Reserve totally dominates our financial system just like this cartoon once warned would happen if we allowed a central bank to control our money….